Boko Haram, referred tae bi themselves as Wilāyat Gharb Ifrīqīyyah (Arabic: الولاية الإسلامية غرب أفريقيا‎, (Islamic State Wast Africae Province, ISWAP), an Jamā'at Ahl as-Sunnah lid-Da'wah wa'l-Jihād (Arabic: جماعة أهل السنة للدعوة والجهاد‎, "Group o the Fowk o Sunnah for Preachin an Jihad"), is an Islamic extremist group based in northeastren Nigerie, an aa active in Chad, Niger an northren Cameroon. ↑ 4.0 4.1 4.2 4.3 Bureau of Counterterrorism. "Country Reports on Terrorism 2013". U.S. Department of State. Retrieved 7 August 2014. ↑ 6.0 6.1 6.2 "Jonathan tasks Defence, Foreign Ministers of Nigeria, Chad, Cameroon, Niger, Benin on Boko Haram's defeat". sunnewsonline.com. ↑ 7.0 7.1 7.2 Martin Williams. "African leaders pledge 'total war' on Boko Haram after Nigeria kidnap". The Guardian. ↑ "Chadian Forces Deploy Against Boko Haram". VOA. 16 January 2015. Retrieved 16 January 2015. ↑ "Boko Haram Changes Name To 'West African Province' Of The Islamic State". Daily Times of Nigeria. 23 April 2015. Retrieved 21 July 2015. 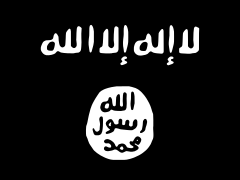 ↑ "Is Islamic State shaping Boko Haram media?". bbc. 4 March 2015. Retrieved 24 September 2015. This page wis last eeditit on 15 Februar 2018, at 20:48.